Processing your breakbeats can help them to work much better in a DnD context. Drum 'n' bass is in a great place in 2014. As broad a church as any style of dance music, DnB has something for everyone. From the minimal atmospherics of Exit Records to the full-on jump-up insanity of Real Playaz, and from the deep dark fury of Metalheadz to the liquid euphoria of Fokuz, every conceivable sub-genre is vibrant and flush with exciting new music. All of which means that, if you want to compete, you need to be at the top of your production game, - we've got 11 things to try to keep you ahead of the chasing pack. Production standards in modern DnB tracks are higher than they've ever been, so it's vital that you use great quality source sounds right from the beginning of the production process. If you're starting out on the road to DnB success, check out Loopmasters' Artist Series, Vengeance, Sample Magic, Resonance Sound, BHK Samples or our own VIP Series collections for some clean and weighty source samples. 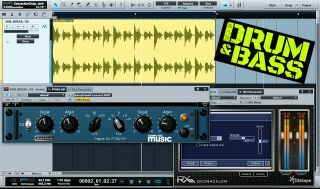 The sampled breakbeat often forms the heart and soul of a DnB drum track, but the classic loops can take some processing to fit them in the context of DnB. Aside from the timestretching and pitchshifting required to get them 'up to speed', their frequency content, stereo width and dynamics will likely need addressing. EQ, noise reduction, multiband compression/gating and width plugins will help you get there. Stacking sounds can give a more weighty, powerful and professional '3D' sound. This technique is ideal for building DnB drums, as you can blend the character of sampled drum breaks or hits with more modern and punchy electronic samples, keeping that jungle/DnB vibe but adding pro thickness. Many genres of dance, such as house, EDM and techno, are driven by a bass-heavy kick with lots of low-end weight in the 40-80Hz region. DnB is a different animal - you want your sub bass part to fill out the track's lowest frequencies, so use enveloping, transposing and EQ to shorten your kick drum and get its fundamental hitting more around the 90-100Hz area, carving room for low sub. It might be tempting to create your track in chronological order, first building up a delicate intro ands taking it from there. However, DnB is all about the drop, so you might want to try building this most important section first. You'll then be able to go back and tease in subtle drop elements through the intro and breakdown, giving you more inspiration and direction when composing. Resampling is the art of exporting out a sound you've processed and/or modulated - capturing a snapshot of a particular modulation or movement in time - so you can then re-import the audio back into your DAW or sampler for further processing, helping you achieve complex twisting movements heard in more aggressive 'neuro' styles of DnB. You also save CPU and keep your projects tidier as a result. Slower dance styles are usually arranged in eight-bar sections, but DnB's frenetic pace means that the majority of tracks stick to 16- or 32-bar sections. To keep your music DJ-friendly, give the DJ at least a 32-bar intro to mix your track in, and add a hi-hat or filtered beat over breakdowns so spinners have some freedom to mix over the quieter sections of your track. It might make sense to create a twisting mid-range bass layer first then layer a simple sine sub underneath for solid weight. However, this can cause a disparity between the two layers, as the mid's movement will be missing from the static sub. To get around this, begin with a subby, harmonic moving layer first, then create gritty mids and highs by duplicating the sub track (or sending it to return channels) and distorting/filtering it. Major scales aren't usually employed in drum 'n' bass, with most styles favouring the more melancholic minor scales to create a more serious mood. The more evil-sounding forms of DnB will also make use of the pentatonic scale. To construct this scale, remove the second and sixth notes of the natural minor scale - for A minor, that'd be B and F, leaving A C D E G.
Drum 'n' bass music requires a complex palette of sounds, so you could find yourself getting bogged down in the throes of sound design, killing off inspiration when you're trying to get a track finished. Consider scheduling dedicated sound design sessions so you can craft those complex twisting basses and modulating drones ready for use in a latter arrangement session. When you begin a track, make it a habit to decide upon your root note before adding musical sounds or riffs, as then you'll be sure your sub bass will really punch in the right frequency areas. Try to make some of your bass notes hit around E1 to G1 for maximum bass weight, as relying on too many notes above or below this point can sound too honky or overly flabby.